Composer Harrison Birtwhistle (b. 1934) has been creating high modernist music for many decades, yet for some reason I have not paid him sufficient attention. He writes a music that refuses to show a smooth patina, but has a rough-hewn wildness about it. In the composers' words, "Highly polished surfaces are dangerous. You can only see your own reflection in them." And so he proceeds freely and personally to put a scuff on his musical phrases. The intuitive freedom built-in to his works makes them difficult to perform but ultimately highly enigmatic in a way most engaging to the careful listener. All this can be heard in the new release of some of his Chamber Music (ECM New Series B0020436-02), just out yesterday here in the States. There are four substantial works represented that show him most certainly a leader in the generation of British artists to come after Britten. Each work has its own inner life. Two are song cycles, one combines song with extensive instrumental commentary, and there is the Trio for violin, cello and piano. The latter has great depth as well as a horizontal trajectory. Each phrase and its seeming concomitant response from the three instruments have a framed feeling to them, deeply set in their places, the dialog by no means random sounding but unexpected somehow though there is logic to the sequence once you hear it several times. It unfolds like phrases in an unfamiliar language where meaning and sound reveal themselves only gradually. The song cycles are equally intriguing. The "Three Settings from Lorine Niedecker" for soprano and cello and the "Nine Settings from Lorine Niedecker" for the same configuration act as end pieces at the beginning and ending of the program. They are plaintive and haunting, stark and matter-of-fact in a terse Webernian sense, helped along greatly by the artistry of soprano Amy Freston and cellist Adrian Brendel. "Bogenstrich--Meditations on a Poem of Rilke" is more dramatic and expansive, and sometimes more lively with baritone Roderick Williams playing off of pianist Till Fellner and cellist Brendel in sometimes more extroverted, dramatic ways. There is more in the way of density at times in contrast to the other vocal works, yet too at times a contemplative, mysterious quality in common with them. The baritone has its say and the instrumentalists then comment upon the proceedings at some length. Williams returns in the final movement and the cycle comes full circle without repetition as much as reiteration and recursion. We haven't mentioned violinist Lisa Batiashvili, but kudos to her for her role in the Trio. In fact all give precise, energized interpretations of these works. It is a superlative program and the performers give life to the music with sympathy, understanding and tempered feeling. I have gained much from this program. Birtwhistle becomes less enigmatic and more familiar to me thanks to this music. That he is neither here nor there is the point, for that is what Birtwhistle strives for--to disappear from your perceptions in favor of the tones themselves. That is what makes him special, it seems to me. He is more an embodiment of musical being and less of musical personality than perhaps anyone in his generation. Bravo for that! We all know something of the story of how classical music, jazz, blues, rock and (for better-or-worse) pop styles have diffused out of Europe or America and developed regional versions throughout most of the world. The newly forged music (some now 100 or more years old) features localized forms that often draw upon indigenous music traditions in a cross-breeding process that usually creates something much more than the sum of parts. The local flourishing is no less important than the initial impetus today. If we want to gauge what is going on in any serious music category we must look to the world and what evidence of human creativity and achievement that we find. Bright Sheng (b. 1955) a Chinese composer coming into prominence over here via a new disk of his compositions, is an excellent example. The Blazing Mirage (Naxos 8.570610) presents three major works as performed by the Hong Kong Philharmonic and soloists under the composer's direction. What's impressive from the beginning is the full integration of local elements and the modernist symphonic outlook into an original and cohesive style. Each work lasts approximately 20 minutes and contrasts soloists and orchestra in concerto-like dialogs. "The Song and Dance of Tears" (2003, rev. 2013) showcases the traditional Chinese pipa and the sheng, along with cello and piano in a work that draws inspiration from the collection of ancient folk music the composer collected in a special field trip organized to that end along the inner borders of China more than a decade ago, following a musically lesser-examined yet crucial portion of the historical "silk road" trade route. "Colors of Crimson" (2004) has a rather striking solo marimba part and has as its basis a love song the composer wrote as a young musician in China years ago. "The Blazing Mirage" (2012) concentrates on pitting the orchestra against a very expressive solo part for cello. It was inspired by the 4th century Buddhist frescoes and manuscripts found in the Dunhuang Caves. Each of the three works has its own special quality but together they show a composer of a thoroughly modern cast who nonetheless incorporates something of his heritage. The result is a music of today that has both local and international thrust. These are works to experience in depth. There is a sure-handed orchestral flair to them and the solo parts do all they should to expand the colors and melodic movement of the works. And the performances are very good indeed. 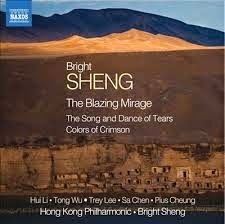 Bright Sheng gives us formidable music on this disk. By evidence of these works we need to be hearing more of him! Very much recommended. 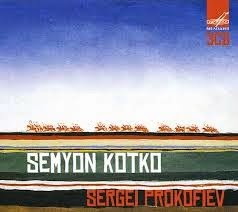 Prokofiev's opera Semyon Kotko (Melodiya CD 10 02120 3-CD) is the least known of all he wrote. Part of that has to do with the politics of the Stalin era, the other part has probably to do with the plot. Prokofiev settled back in his home country at the height of an iron-fisted censorship imposed on composers in line with the "social realism" demands of the Soviet apparatchik. Doing his best to satisfy their demands he chose a libretto that centered around a peasant village in the Ukraine during WWI and the opposing relations the peasants had with German and Soviet troops. The libretto included a number of Ukrainian folk-song lyrics but Prokofiev insisted (rightly) on writing his own melodies for them. Prokofiev tried to produce a "popular" work but the apparatchiks panned it and it was not performed again for many years after its initial run back in 1940. It wasn't until 1960 that the present, first complete recording of the full opera was made and the work became acceptable and, eventually, a regular part of the repertoire there in the USSR. In Europe and the US the libretto seemingly had less appeal and I never saw any versions of it around in stores from my early listening/collecting days on. In any event the music shows Prokofiev in good form. There were his modernist elements, some of that rare melodic gift he had, things which went to make him the musical personality he was, and though that was not acceptable at the time it sounds right today. The music has definite appeal. If this Melodiya recording doesn't have a libretto in Russian and translation it matters not all that much because it is the music that triumphs above all. It's a full-length opera filling three disks and I find it a fascinating listen. It may not be the best of all of Prokofiev--the Flaming Angel opera-wise has the leg up on that to me, but it gives the Prokofiev lover a treasure that adds considerably to what we have from that middle period. The performances are excellent. I am glad to have it. The politics of the region make it topical, but that is neither in its favor nor to its disadvantage, because it was a story set in different times and has little or nothing to do with events today to my mind. Prokofiev lovers rejoice! 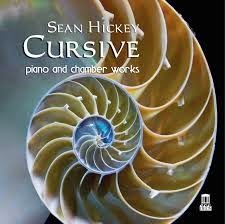 Sean Hickey composes like a "natural", meaning that his music strikes one as a kind of inevitable expression of a personal musical self. The music doesn't call attention to itself as a breakthrough model of a new style. He writes music in an international modern vein. His Concertos album I posted on here last May 31st. What I found to be true of his large-scale works carries over to this nicely played collection of small chamber pieces, Cursive (Delos 3465). That is, they are extremely well-crafted, expressive works that sit solidly with the listener (me) after a few listens. In all, the collection features works written between 1998 and 2012, six for piano solo, one for violin and piano, and a work for flute, viola and harp. Philip Edward Fisher gives us sensitive and dynamic readings of the piano works, Julia Sakharova joins him on violin for the duo piece, and the trio "Pied-a-tere" showcases Brandon Patrick George on flute, Anne Lanzilotti on viola and Meredith Clark on harp. All sound especially well disposed towards this music and give us lyrical and spirited readings. The chamber music of Maestro Hickey as heard on this disk has rhythmic drive and a subtly invigorating modern harmonic and melodic thrust. Sean Hickey has talent and, while by no means attempting to stretch the borders of the contemporary idiom, manages to create works that have a kind of lasting personal impact, an eloquent vocabulary of melodic-harmonic ideas well expressed. Not all music is meant to change the world. Some is meant to brighten the space around it, to draw you into its own particular world with both beauty and strength. That's what Sean Hickey's chamber music does to me, as heard on this set. I think you will find this anthology a welcome addition, with a music as comfortable as a favorite pair of sneakers, as contentful as a favorite volume of poetry. Listen and be convinced. Some music doesn't particularly belong to a camp yet stands on its own so well it forms its own category of one. 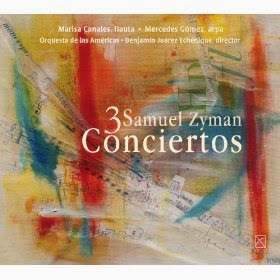 Samuel Zyman's music on 3 Concertos (Urtext 225) does that. Zyman gives us his "Concerto no 2 'De Mineria' for Flute and Orchestra", his "Concerto for Harp, Flute and Orchestra" and his "Concerto for Harp and Orchestra". The three works go especially well together. The soloists are near ideal in Marisa Canales on flute and Mercedes Gomez on harp. And the Orquesta de las Americas sounds beautifully idiomatic under conductor Benjamin Juarez Echenique. For these works there is a pronounced Latin American feel in the music's minor mode flourish, plus perhaps a shade of Zyman's Jewish heritage. The music is thematically rich, well structured and rhythmically vibrant. Ms. Canales brings an articulately exuberant lyricism with some bite to the flute parts; Ms. Gomez plays quite beautifully with a hint of the staccato feel that comes out of traditional south-of-the-border harp music in the folk vernacular. The music has a modern touch yet brings the thematic memorability of earlier times into play. It's almost neo-classical in its elegance of form and content, not really Stravinskian but with an appeal not unlike Igor's music in his middle phase. It is delightful in every way. Score! Definitely recommended. Reinhold Moritsevich Glière (1875-1956) may not be at the tip of your tongue when it comes to naming Russian composers of the 20th century. In his day in his home country he was a celebrated figure. You may know his ballet, The Red Poppy. You may not know much else. Yet his Symphony No. 3 in B minor "Il’ya Muromets", Op. 42 (Naxos 8.573161) is a towering work for large orchestra, a late romantic blockbuster that rivals Bruckner and Mahler for scope if not actual content, yet throughout has a thoroughly Russian caste to it. For whatever reason it has not been available all that frequently on disk here in the States. Hermann Scherchen and the Vienna State Opera Orchestra did a version in 1952 I believe, which was complete on two LPs; there was a Russian version that came out on Columbia in the later '50s but if I am not mistaken it was edited to fit onto one LP. Part of the difficulty back then was that it was too long a work for one LP and not quite long enough for two. That doesn't seem like a good enough reason to ignore the work but things do happen, or rather don't happen out there for even lesser reasons. I have both analog versions and have appreciated the symphony for a long while. If there were digital era recordings of the work I missed them. 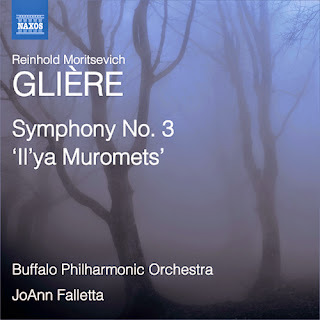 But now at last we have a complete performance of the third recently recorded in full fidelity by JoAnn Falletta and the Buffalo Philharmonic. It is out on Naxos--so the price is right. There is more than price that makes this a worthy release, however. 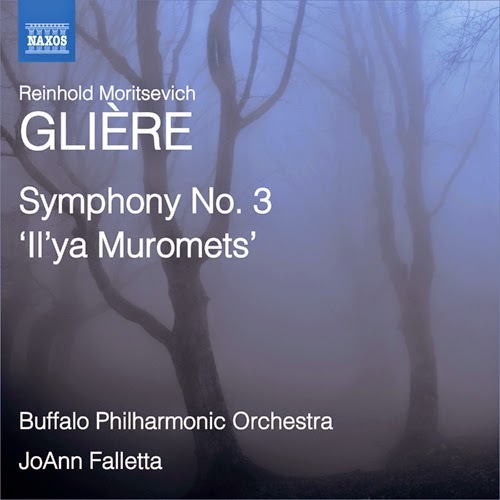 JoAnn Falletta is a first-rank conductor for romantic and late-romantic fare and she has been doing some wonderful things up in Buffalo, many on Naxos. We've covered more than a few on these pages. 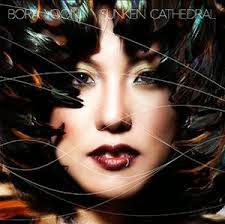 And surely she captures the epic breadth and spirit of Glière's symphonic masterpiece. Sprawling a work it is, but filled with passion and excitement. And originality. There may be times where you might hear the influences of Scriabin, Rimsky-Korsakov and the late romantics that came before. The perception quickly disperses, though, in the next contrasting section, so by and large we have a tabula rasa Russian work of excellence. Glière finished the work by 1911. That makes sense, stylistically. It is a work not of the avant garde so much as within the advanced mainstream, though undoubtedly not everybody took it in during the first performances in those days. Suffice to say that Ms. Falletta does indeed triumph here. The performance is nothing short of marvelous. Grab this one. 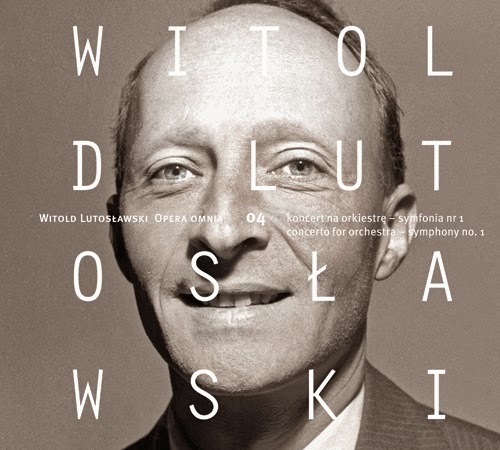 As we pass the 100th anniversary of the birth of Polish composer Witold Lutowslawski (1913-1994), we are happily seeing a good deal of his music available to us. One especially notable and ambitious undertaking is the Opera Omnia (instytut muzyki i tanca), which I presume when finished will comprise his entire orchestral output. Up today is Volume 4, which includes his "Concerto for Orchestra" (1950-54) and his "Symphony No. 1" (1941-47). 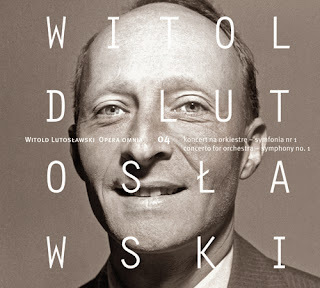 Stanislaw Skrowaczewski conducts the NFM Warsaw Philharmonic Orchestra. These are two works of great interest that we might not otherwise get the chance to hear. The performances are good. Both works are in an earlier, yet invigorating style. They do not sound quite as abstract or "modern' as his later works. They are harmonically advanced with melodic contours more linear and unfolding, a bit more similar to Bartok's later works without suggesting that they are in any way derivative. No, Lutoslawski has come into his own by the time he wrote these. They are highly attractive, very well-wrought works of their time. They fully deserve our attention. And they flesh out the early-mid period of his music in excellent ways. Highly recommended. Elliott Carter was one of America's greatest composers of the last half of the twentieth century. He lived a long while, which happily translates into a body of works the full breadth of which we are still unravelling. That he was the absolute master of abstract, late high modernism means that he may never be a household name out there, perhaps. But it does mean that all his later works bear our close attention, if we take modern music seriously. What's true of Carter is true of many of the high-modern masters. That is that it takes more than the average number of listens to wrap yourself around the terrain of a particular work. The music must be heard beyond your initial intuitive level to be understood, because the musical language is most certainly not vernacular, but rather developed to a state beyond which you normally dwell. The rewards are great, however. 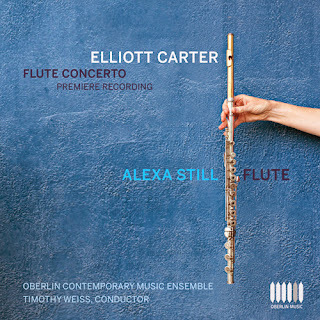 So today we get to hear a previously unrecorded composition, his Concerto for Flute (Oberlin Music), a 14-minute work performed ably by Alexa Still and the Oberlin Contemporary Music Ensemble, Timothy Weiss conducting. The ensemble appears here in the form of a fairly large chamber orchestra. The recording is available as a download only. One of the pitfalls of such downloads can be the assumption that like a pop fan, you care little about what you are downloading, you just want a song and who cares for the rest! That is not entirely true across the board on various sites, but it's close enough to it that most download sites are insultingly absent on details. So here on itunes. I do not know when it was written, though it sounds fairly late in Carter's career. It has a chamber orchestra part that is filled with spaces for the solo flute and so one experiences a ying and yang of flute and chamber orchestra in alternation. It has very punctuated parts for the orchestra at times and a soaring flute part that Ms. Still handles wonderfully. The orchestra has a razor-sharp execution. Well rehearsed and confident, all participants make this an event, an occasion, a celebration of Carter. If you are like me and find Carter an absolute necessity in life, this will appeal greatly. If you don't know Carter's music, this recording has the advantage of being very short, so that you can listen quite a few times and get closer to the music without spending weeks doing it. It is a Carter work that has the complexity built-in so that it is ever unfolding to you each time you re-hear it. Alexa Still gives us a marvelous reading and the CMS under Weiss is spot-on. Stereo is King (Innova 882). That is the title of Mason Bates' CD release of various interrelated compositions. It at once suggests a retro stance, harking back to the late '50s when stereo was a huge big deal. Yet the image on the cover shows an odd assemblage that looks both retro and futuristic. The work depicted there is called Chained to the Future, a sculpted/constructed object by Jason Brammer. The image and title suggest how back then the future was seen as almost inevitable. Yet that future as it comes to us now is perhaps anything but what we expected. And we don't look to the coming years in quite the google-eyed way some did in earlier times. And so maybe the music of Mason Bates has the "not what we expected" futurism built-in? Surely the music is of our day, and it may not be what we thought it would be in 1958. And surely modernism is not the monolithic minimal super-clean squeaky world we may have collectively envisioned. It is many things, but not one-dimensional. Mason Bates' music is like that, or a part of that. He encompasses a post-minimalism, working within a tonal vein that suggests the contrapuntal thrust of minimalism at its best, but not much of the repetition beyond some ostinato figures. There are implications of rock-funk sometimes without anything more than a suggestion of the obvious drums and bass (except as electronically created on "Terrycloth Troposphere") and instead an involved give-and-take counterpoint among the instruments. There are other works that linger awhile with a more lyrical unfolding. Mason makes a music of our time that has his particular original voice stamped onto it. The music forces summoned from work-to-work fluctuate somewhat. Generally it is mid-sized chamber ensembles comprised of Bates' own electronica assemblages, the vocal group Chanticleer, members of the Chicago Symphony Orchestra, the Claremont Trio and Tania Stavreva on piano. Unlike some of the "radical tonality" folks we have been talking about here, this music has more motility, less soundscaping and more what one could almost call a "neo-baroque" stance. It comes our way and, like anything else, it is gone, unless we choose to play it again immediately afterwards. But what is between "start" and "finish" is some well put-together, thoughtful and vibrant music that creates a syntax that flows in "variations-on-variation" ways. It is no mere hearkening back. It has more of a modernist pan-thematic unfolding stance than the old through-composed melodic and harmonic periodicity of the pre-modern of 100 years ago. 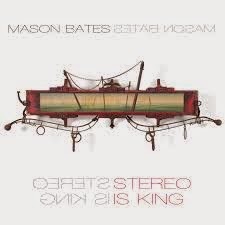 Mason Bates has a fertile musical mind that comes through here in ways that reward the listener with something complex enough, substantial enough to keep interest level high and yet quite accessible even for those who may eschew a brasher modernism. Well done! Bravo! Of all the composers in the pantheon, Mozart may have been the one with the most native genius. He was reputed to hear whole compositions in his head before he put them to paper. His music, especially the many Piano Concertos, can sound effortless. But then arguably the classical period had the most in the way of preconceived forms, movement sequences that were more or less standardized, sonata form structures that laid out what was to be done with thematic materials and the like. We know that these forms were subject to continual variation and innovations from studies done in the past century. But when we listen to a Mozart Piano Concerto there is such a concentrated lucidity. such a wealth of invention that flows so easily to its goal that we could imagine that putting one of these together was a fairly simple matter for Mozart. After all, the showcasing of his virtuoso piano style was one of his bread-and-butter activities. That explains why he wrote so many. Yet the facility he doubtless had doesn't really mean that he did not have to work at it. It wasn't all inspiration and ease. It couldn't have been. Whatever the case, Mozart's Piano Concertos are some of the very finest examples of his era. He did much to make the form a kind of institution in the years to come. And the best literally overflow with melodic excellence. 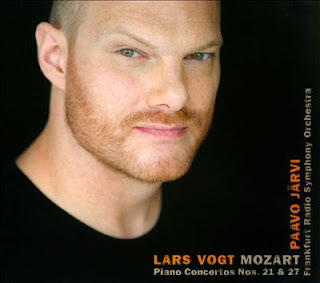 Today we have a very nice recording of two of the later concertos, Nos. 21 & 27 (Avi-Music 8553257), performed by pianist Lars Vogt with Paavo Jarvi conducting the Frankfurt Radio Symphony Orchestra. They are delightfully done, filled with spirit, sonically excellent and performed with a near-perfect balance of feeling and forward motion. If these sound easy to have written, they most certainly weren't. It is part of Mozart's genius to make the music he wrote sound inevitable. Perhaps you don't get that in Don Giovanni or his Requiem, because they have some colossal expression to them that the concertos do not. But a close listen to concertos 21 & 27, especially in the expert sympathetic hands of the performers here, reveals near perfection of form and content. It would take a Beethoven to make the concerto seem "difficult" again. These Mozart works achieved the maximum in inventiveness within the forms of the day. No one did it better. And these performances bring us as close as you get to the mind of the master composer. So do not hesitate. Eduardo Raon creates a twelve-part sound poem he calls On the Drive for Impulsive Actions (ShhPuma CleanFeed 007). The music is created on harp for the most part, played conventionally and unconventionally. At times it sounds like it is also multi-tracked, and it is at times subject to electronic manipulation. There is also something he calls the Daxophone, percussion, the occasional sound of voices in laughter--children and adults--and the appearance of the whir of Screaming Cicadas. First of all, a note of appreciation for all those young composers embarking on a career, trying to make their way in a world where composing for a living is no easy matter. One such composer today is Michael Vincent Waller. 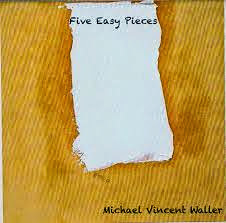 He dwells in and around New York City and has put together an EP of a compositional suite for solo piano, Five Easy Pieces (Bandcamp). It is music that suggests a stance that is rather post-Glassian. There is a certain amount of repetition but mostly that repetition varies and develops. There is symmetry, its opposite, and an emphasis on scalular melody. The music makes use of scales and primal harmonies that at once suggest traditional Asian music and also some of the impressionists' stock-in-trade, such as whole-tone scales. Like the earlier volumes of Bartok's Mikrokosmos, it would seem to have real pedagogic utility for the pianist getting underway in his or her studies--the intermediate beginner. It would give students another entryway into some of the tonal music of today, giving them experience with asymmetrical and symmetrical phrasings in alternation. And the music is evocative enough to give them pleasure. As for the listener this is music that is not uninteresting. But it does seems to me to show a musical style under construction, an edifice just beginning to show its own special images but by no means complete. Japanese pianist Gumi Shibata and Chinese pianist Jenny Q. Chai share the performance duties on this 24-minute EP. They sound fine. Like the earlier volumes of Mikrokosmos, these pieces seem like waystations on a journey to a more involved and complicated style, something to challenge a young pianist and be rewarding to hear. I await further developments and wish Michael Vincent Waller much success and good fortune. Of all the works Bach wrote initially for solo harpsichord, his Six Partitas sound especially well on the piano. David Korevaar (MSR 1461, 2CDs) gives us a new version of the cycle that to me affirms this. 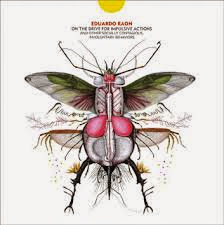 Any of Bach's keyboard works sound well on the piano in sensitive hands, granted, but the Partitas have non-contrapuntal as well as contrapuntal elements that manage to sound idiomatic on piano. Years ago when I was in school in Chicago I had the luck to live very close to a very good used record store. Hyde Park had a large contingent of university students and faculty which in part explained some of the assortment of interesting items for sale there. I found a very old Remington LP release of Partita No. 6, I believe, by pianist Jorg Demus. I loved the tone he coaxed out of the piano already from hearing his Schubert sonatas, and this recording did not disappoint. He was neither quite romantic in his renditions nor did he have the dash and velocity of a Glenn Gould, but there was something just right about it all. Unfortunately Remington was a US budget label of the early '50s and what they pressed their disks on wasn't vinyl, nor slate; it seemed to be a brittle, cookie-like oil-based substance that meant the records wore out quickly. My copy of the Demus had been well-played and parts of the record didn't skip as much as slide forward a minute or two into the performance in ways that exasperated. When I left Chicago it got left behind but I still remember the recording fondly, slides and all. The new David Korevaar renditions of all six Partitas doesn't quite have the Demus tone. But it does have everything else going for it. He gives us a carefully meticulous reading with lots of spirit. Very idiomatically pianistically, the performances use a fair amount of ornamentation so that they also sound suitably baroque. The set is rather marvelous and the music, of course, is some of Bach's very best. The multi-movemented, French inspired dance suites sound better than ever in Korevaar's hands. Of all living American composers, Carson Cooman is among the most prolific, or at least so I understand. We looked at his organ music a couple of weeks ago. 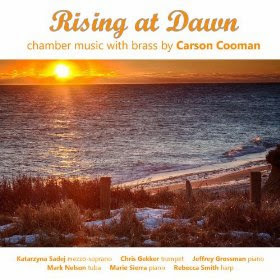 Now it is time for another recent release, Rising at Dawn, Chamber Music with Brass (Metier 28538). The organ music disk showed Cooman in a very idiomatic organ mode. The present collection of works broadens our vision of his musical personality considerably. 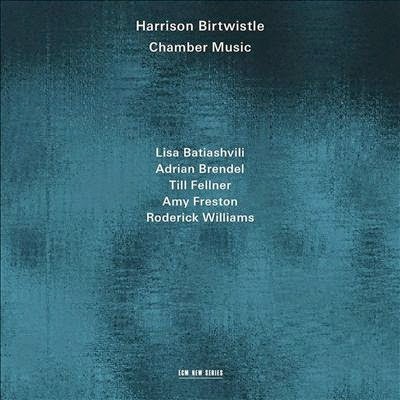 There are eight chamber works contained on the disk, written between 2005 and 2011. Most are fairly brief, except the several movement pieces. Three are for solo piano. The rest are for trumpet, flugelhorn or tuba in prominent relief. If you were to pigeonhole Cooman's style here, to give you an idea of the music, you would say he is closer to Hindemith than Boulez. He is not a serialist, but he sometimes stretches the harmonic base in a modern way. Other times he is consonant, so to speak, but not in a romantic or especially neo-classic sense, more of today. All the works presented have genuine substance. A brief song cycle, "Chasing the Moon Down" makes effective use of mezzo-soprano, trumpet and piano. Other works follow for solo trumpet, flugelhorn and harp, trumpet and piano and a very effectively vibrant "Sonata for Tuba and Piano" (2007) in three movements. The performances are excellent, the works memorable and well put-together, and the sequence of works quite pleasing. This is a winner. It serves as an admirable introduction to the composer in a chamber mode. And for the brass-a-holics out there it is something you must not miss. Swedish composer Allan Pettersson (1911-80) stands out as one of the more enigmatic figures in 20th century symphonic music. In his later period he rejected the "pure" modernism of serialism then in fashion, instead creating works in a highly personal idiom, long sprawling works that contained atonal, pantonal and tonal modes in juxtaposition. They tend to be on the dark side. That should serve as an introduction to what is at hand today, a recording of Pettersson's Symphony No. 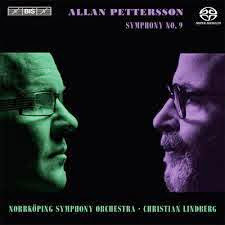 9 (BIS 2038 SACD), as performed by the Norrkoping Symphony Orchestra, Christian Lindberg conducting. The release contains a bonus DVD of the 81-minute biographical documentary "Vox Humana", filmed between 1973-78 and originally aired on Swedish television. It is mostly in Swedish with English subtitles. That documentary brings us a vision of Pettersson's early childhood as brutal and poverty-stricken, his musical tutelage as precariously subject to the exigencies of European historical developments, such as the Nazi occupation of Paris where he was studying viola at the time. The advent of his long and serious affliction with rheumatoid arthritis and kidney disease in his final decades had great impact on his music. He was an invalid and shut-in while continuing to compose. The struggle to overcome became key to his music and both its heroic and dark qualities, as the DVD implies. His afflictions get a portrayal that has moments that are nothing short of harrowing. Christian Lindberg, a long-time champion of the composer and sponsor of the DVD comments in the end that Pettersson shares something of the personal outlook of famed filmmaker Ingmar Bergman. And that rings true. You might think of Pettersson as the symphonic analog of Bergman and it would not be wholly nonsense to say it. And yet the music stands on its own without such analogies. Between 1953 and 1980 when he composed most of his output he wrote a total of 16 symphonies. It is as a symphonist that he is known since only a few works were not such. By the time he wrote his 9th he was fully immersed in the stylistic particularities of his mature period. It is a long work (70 minutes) in one single movement. The symphony seems to represent a never-ending struggle. Passages of dissonant turbulence, chromatic clashes and ultra-advanced yet continually forward moving passages rub against tonal moments that offer the promise of brief refuge only to be enveloped again in the symphonic sea of motifs that ever surges forward. Peace and resolution are only obtained in the final "amen" of the symphony. It is a symphony at once both intensely dramatic, epic in its masterful treatment of a large orchestra, and in the end an affirmation that struggles are a real part of life, but that they do end in one way or another. No one wrote symphonies in quite this way before him. The originality is there along with a tenuous connection with the largess of a Bruckner or a Mahler. He uses the orchestra masterfully in ways not entirely removed from these giants. But it is music that bears the undeniable stamp of Petterssonian originality and the modern age in which he lived. As the DVD makes plain, Pettersson champions the voice of "man", the endless struggle to overcome the darknesses of our times. The performance has authority. It is most likely the definitive version for many years to come. Christian Lindberg understands Pettersson, that is clear. And the orchestra gives a heroic performance. The DVD offers extraordinary insight into the composer. If you want to know something of Allan Pettersson's music, here is the ideal starting point. Or if you know him this will be essential listening. Either way it is a seminal work in a definitive performance. What more can I say? Enough. The art of the collage in the early 20th century and beyond changed the way we are used to seeing reality. In music the variations form has for a long time worked in a collage-like idiom, perhaps seeing its most thorough-going modernist expressions in Cage's "Variations IV" for any number of recordings and any number of other sounds, and perhaps also Lukas Foss's "Geode", which did the same in a more controlled way for a live ensemble. A more specific form of collage came about through the transformation of Bach and other composers of the baroque era into modern terms. This too has a fairly recent set of precedents. I can think of two compositions from the later '60s that re-thought the music in dramatic terms. One was Lukas Foss's "Baroque Variations", a piece in several movements that took Bach and other baroque composers and forged a completely modern kaleidoscopic work on the themes. It was recorded by Foss and the Buffalo Philharmonic and released in those days on the Nonesuch label. Another was Cage & Hiller's HPSCHD, which involved the simultaneous playing of seven harpsichord works from the era and beyond, thickened further by multi-computer generated sounds. It too enjoyed notoriety as a Nonesuch release. We fast-forward to today and the adventuresome Absolute Ensemble, a chamber group under the direction of Kristjan Jarvi. They have sponsored three compositions based on Bach's Inventions. Each re-composition situates a particular invention in a very modern contemporary musical world, using the lines contained in the invention as a springboard. We get to enjoy three current-day fantasias that in themselves thrive on inventive personal visions of what can be done when set free of all restrictions save that they be performable by the Absolute Ensemble. The product of all this is Jarvi and the Absolute Ensemble's recording Bach Re-Invented (Sony 88691941682). For the program the particular Bach Invention that gave rise to the re-invented composition at hand is first played straightforwardly on the piano. So Bach's "Invention No. 1" precedes Gene Pritsker's "Reinventions (Piano Concerto)". The "Invention No. 4" sets things up for Daniel Schnyder's "toopART Reinventions" a "Concerto Grosso for Chamber Orchestra, Two Keyboards and Saxophone". Finally Bach's "Invention No. 8" introduces Tom Trapp's somewhat brief piece, "Headless Snowman". Pritsker and Schnyder are ensemble members in addition to creating their compositions. All three works weave multi-stylistic components together in rather brilliant ways. Pritsker has the most far-ranging series of juxtapositions, from modern classical through to metal, world elements and a bit of house/hip-hop, jazz and world music. All fit together in a swirling miasma of virtuoso musical thinking. It is music of some definite brilliance. Daniel Schnyder's "toopART Reinventions" is a brilliantly conceived reworking as well, but perhaps less stylistically "kitchen synked". He works a bit more sustainedly within the jazz-classical nexus, but does so in ways that surprise, too. Tom Trapp's "Headless Snowman" has the most through-composed feel to it, which makes sense given its brevity. He puts some rock weight into his reinvention and generally leaves us smiling. There are few ensembles that could pull off the multi-stranded demands of the music here and Absolute Ensemble is not only one of them--they excel at it. It is a testimony to their multi-styled virtuosity that this is so. The compositions are revolutionary in the postmodern sense. In that and any other sense this is music you should hear. It may bend your mind as to what-goes-with-what, but it will do so in a superbly inventive way. What is going on right now? Part of the answer lies in this disk. Hear it. Hear it! Change-in-continuity is such a factor in listening to classical music that often we can experience a composer and a particular work as it relates to the past, as it relates to the music to come, or simply in its own right. Often all three factors can enter into play when you feel receptive to a work. 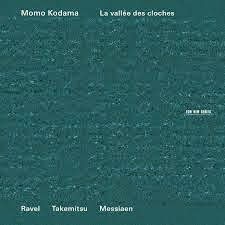 Momo Kodama and her release of solo piano music La vallee des cloches (ECM New Series B0019862-02) invites us to hear Ravel as he sets the stage for a later, more modern impressionism that goes beyond itself vis-a-vis the music of Takemitsu and Messiaen. We of a certain age I suppose are used to thinking of a real break between the impressionists and high modernism, though in some cases the differences from work-to-work are more incremental than an abrupt displacing would suggest. The harmonies get more advanced and rhythmically there can be sharp contrasts, but deep down there is connectivity. It may take an artist that has real affinity for the ways of a particular line of musical development for us to feel the similarities more directly than with other performers. And the choice of works of course are critical. This is something that I think as I listen to Momo Kodama's recital. Ravel's "Miroirs" suite was a real eye opener when I heard Ravel's touch-sensitive piano roll rendition on an old LP years ago. He played it all rather slowly and the attention to sheer intervallic, sensuous interplay awoke me to some of the beauty I had missed, but also helped me hear more of the modernity in the music. "The Valley of the Bells", the final movement of the suite, especially seemed more than just evocative to me. Ms. Kodama gives us a sparkling reading of the suite, in some ways close to Ravel's own reading, but a touch more expressively poetic. It is a beautiful sonance in any event, made even more so by the artistry of Momo Kodama. When the program leads us into Toru Takemitsu's "Rain Tree Sketch" from 1982, we do not feel so much that we have left the path Ravel set out for us in 1904-5, but that in fact we have moved further along it. And surprisingly, with Messiaen's later masterpiece "Fauvette des jardins" (1970) we continue to feel affinity and a family kind of resemblance. Part of that is the deft way Ms. Kodama has of handling the complex phraseology of Messiaen's bird-song abstractions. She makes the figures breath so that the complexities have a comprehensible syntax that we can more readily assimilate. And in the end the three works seem related in their poetic transformation of nature and the human experience of place. They seem part of a continuum, perhaps ideally experienced in the time of the year where nature flourishes, the beginning of which marks the time I write these words and hear this music. What matters I suppose is that Momo Kodama gives us marvelous readings of these 20th-century composers, keenly attuned to their worlds, seeking to capture it all in vibrantly poetic terms. Perhaps now that we have a number of years in the new century under our belt we are better served to hear the connections and the poetry. This is masterful music heard as from a distance in time. Ms. Kodama does the music perfect poetic justice. We are all the better for this recital. I recommend that you immerse yourself in it. Alessandro Appignani, composer and pianist, embodies a new music ethos that embraces polystylism. Mathematics, mysticism and philosophy influence his musical concerns. 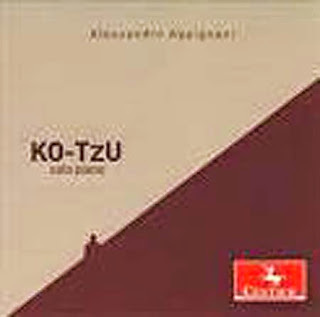 A rather lengthy 2-CD set of his piano music has come out, called Ko-Tzu (Centaur 3304-3305). It is a live recording of a private concert he gave with himself on piano, giving us an impromptu look at the workings of his musical mind. How much is pre-composed in the eight-segment concert and how much improvised I am not sure. The music does have a spontaneous feel to it but of course he may have had and no doubt did have at least some kind of mental template for where he was going throughout. There are times when there seems a genetic connection with the piano improvisations of Cecil Taylor--mostly when Appignani seeks to realize a flat-out expressiveness born of clusters and rumbling cascando motifs. At other times the music grows less dense and relates more to a sort of post-Scriabin consonant-dissonant set of contrasts using techniques of late-romantic pianism but not engaging in concrete theme-weaving. Still other times he plays around with small sets of intervalic relations, mostly of a consonant sort. The two full CDs engage the listener in a good deal of music and it is probably best to approach the music with some breaks in between, as I did. Followers of free avant "jazz" will find themselves in territory at once familiar but also unexpected. The same would apply to those familiar with avant new music for solo piano. One might go so far as to say that there is almost too much here. However the moment you start feeling satiated Appignani changes it all up and gives us some genuinely contrasting explorations. One can appreciate something without embracing it and wearing it like a comfortable pair of jeans. At this point that is where I am with this music. After ten listens I may feel such things about this music. I am not there yet. The breadth of it all challenges the listener to open to it all, but at the same time the bearings one might get with repetition do not come about quickly. That may be saying something profoundly positive about this music. Or it might be saying, "yes it is interesting but...." I am not there yet on either side. That is neither a recommendation exactly, or a declaration on inessentiality. It surely makes me want to hear other music he has done. And the pianist somewhere inside of me responds with approval and encouragement. The analytic, structural me remains open but hasn't been convinced. That may be a good sign, an indication that the structure is there in such new ways that it takes much time to assimilate. In any rate those who want some freely rubatoed rubato will engage and want to understand. Hear and decide for yourself. 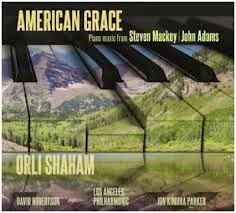 What is percolating in the worlds of pomo-minimal-postminimal piano music gets illumination and lift from pianist Orli Shaham's American Grace (Canary Classics 11). Composer Steven Mackay weighs in with two world premier works, the formidable "Stumble to Grace", a major five-movement piece for Shaham and the Los Angeles Philharmonic under David Robertson, plus a miniature piano work, "Sneaky March". John Adams shows his mettle with a very lucid and invigorating "Hallelujah Junction" for two pianos (Ms. Shaham and Jon Kimura Parker), plus his own piano miniature "China Gates". "Stumble to Grace" has musical depth with modern tonality, propulsive power and lyric charm, channeling Stravinsky and Milhaud a bit perhaps in the references to "jazz" but otherwise standing on its own as music of evocation, with brilliant orchestral scoring and a piano solo part that has great poeticism and demands a fine interpretive brilliance from Ms. Shaham. We surely get that. All of that. "Hallelujah Junction" combines moving minimalist thrust with through-composed, horizontal syntax that is very contemporary but also has a slight touch of American vernacular that makes it very much a work of our space and time. The two pianos interlock contrapuntally in a maze of forward movement. 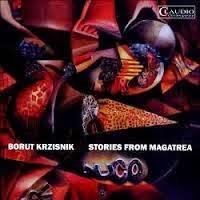 Slovenian composer Borut Krzisnik (b 1961) has a kind of aggressive, almost brutal sound to his music, as judged from his album Stories from Magatrea (Claudio Contemporary 6009-2). A series of six interrelated movements/compositions flow together to create a highly dramatic soundscape that is alternatingly infernal and bleak, menacing and hyper-wrought. He achieves a large, expansive sound by means of four string players (violin, viola and two cellos), clarinet, and a virtual orchestra created by means of keyboard-MINI driven samples. The combination works well to give a large orchestral sound that through its partly virtual nature sounds all the more nightmarish at times. His is a highly kinetic, energized, expanded tonality, a very personally distinctive kind of high modernism that sounds nothing like Stravinsky's "The Rites of Spring" yet shares with that work a highly sophisticated, rhythmically charged "savagery". Krzisnik's music has such power that after a while you accept the sampling presence and appreciate it all as electro-acoustic music of a very original stamp. Nevertheless I would love to hear some of this played by a full orchestra. Either way this establishes Krzisnik in my mind as a composer of great imagination and daring. There are apparently a number of other releases out. If they are of the same high caliber then I suspect we will be hearing a great deal more from this man! Hear this and be transfixed. Joseph Haydn's The Seven Last Words of Christ is one of the most unusual and expressive works of his era. He conceived of it (1786-7) in the first place for string orchestra, for a Good Friday commemoration in Cadiz. He later made a transcription for string quartet. 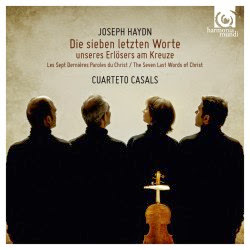 It is this latter version we hear on the Cuarteto Casal's recording (Harmonia Mundi 902162). The nature of the subject matter both demanded and enabled Haydn to disregard the movement expectations of the time. As a sort of instrumental cantata with seven movements, each slow and in a minor key, the "Seven Last Words" breaks ranks with ordinary classical form in this way to come to terms with the meaning and mystery of those last words. Of course the Passion of Christ is central to the Christian year and so on Good Friday it is recounted. It is the darkest of all moments in the religion, followed of course by the jubilation of Easter Sunday. But faith or no, who isn't horrified when in desperation Jesus cries "My God, my God, why hast thou forsaken me?" It is this darkness that Haydn set about representing in musical terms. The classical era was one where there were musical limits set to the expression of the more extreme feelings. Late romanticism or even high modernism (listen to Penderecki's "The Entombment of Christ") was allowed a much wider swath of expression to deal with such themes. That Haydn both worked within and stretched the boundaries of what was allowed him and created in the process an unforgettable work is a testament to his brilliance and in many ways at the edge of what you might say was the "avant garde" of his time. The string orchestra setting is less intimate; the string quartet setting has perhaps a bit less power and dynamics. Both settings are beautiful and ideally you should have both. The Cuarteto Casals gives us as sternly direct and no-nonsense a reading as you'll hear on the quartet end. It expresses the angst and the mystery of the music as well or even better than others I've heard. Such a haunting work needs a certain amount of expressive power at times and a mournful reserve as well, a glimmer of hope and regretful contemplation. The Casals Quartet provides the proper balance that the music demands.